The top themes detected in the stories on the India farmers protests using a machine-learning model created at the MIT Media Lab, How the Indian News Covered the 2017 Farmer Protests: A Quantitative Study. Used with permission. One of the privileges of working on the NewsFrames Initiative is the opportunities we get to think deeply about the challenge of media framing — ways of defining the problem at hand, for example, or the morals that are fundamental to one's perspective. In a recent exchange with folks at Media Cloud, an open source platform for studying media ecosystems that is also a NewsFrames partner, we reflect upon another aspect of framing: who is affected by the way that stories are presented? Consider, for example, the coverage of protesters. In this interview, researchers Anushka Shah and Natalie Gyenes helped us to think through the implications. Anushka: Even though we’re a media research organization, the exact definition of ‘framing’ is the billion dollar question within our group! I understand it as a particular perspective chosen to represent a topic. Imagine you are a photographer and your task is to tell the story of the neighborhood park though one picture. You could choose to take a picture of two siblings playing on the swing-set to present the park as a happy, safe space, or you could zoom into the empty injection vials littered around the bench to show it might in fact be the opposite. You could focus on the trees and foliage to show the importance of preserving green spaces within a city, or you could show the community organization that uses the space to meet and plan activities for the neighborhood. Each of these frames would tell us a different story of the role of the park. Natalie: That’s a great question, and Anushka’s thought experiment is spot on. We’ve discussed this a lot within our group, and have found that chatting about the specific definition of framing depends on the field, or “lens” that someone is approaching the conversation with. My own understanding of framing is that it encompasses the variety of ways that information can be packaged and presented to an audience. The same piece of information can be shared differently depending on the context it is placed within. Anushka: Media narratives are full of frames. Let’s take the example of the US media’s coverage of Hurricane Maria in Puerto Rico versus Hurricane Harvey in Houston, Texas. When we used our platform Media Cloud to study the language difference of the coverage, we saw that Harvey’s coverage had a human focus: the plight of the victims, ways to donate, and material required on ground. Maria on the other hand had a political focus: what Trump tweeted, the response of Puerto Rico’s mayor, and the US Federal Emergency Management Agency’s (FEMA) role. The difference in frames may have been because perhaps the media outlets sensed a hurricane news fatigue in the audience as Maria came third in line, or because as we often see with coverage of minority populations, there’s not that much interest in the human angle there. Natalie: We can also think about the perspectives shared in media narratives, and how the ones represented by the media can help shape how the public thinks about an issue. For example, take the early collaboration between NewsFrames and Media Cloud when we used our tools to explore how indigenous issues are covered in the media. Our examination of media coverage related to the Dakota Access Pipeline (DAPL) uncovered a way that mainstream media was portraying the issue differently from the framing that the Native American tribes at the Standing Rock Reservation in North Dakota were using. In interviews with Native Americans, and in Native American media sources, individuals declared themselves “water protectors,” which is different from the strong “protester” frame prevalent in mainstream media. Using this “protester” frame keeps the focus away from larger, systemic issues about land access and water quality, and focuses instead on short-term events taking place in opposition to the pipeline. It also doesn’t take into consideration the perspectives of the communities being represented in media coverage. Anushka: I think the study of frames is very important because intentions and incentives are very strongly linked to frames. Why do we choose to tell one story over another? Identifying a frame gives an insight into the motives of the author of that frame, and this is fundamental to knowing the distortions within the news presented to us. I enjoy reading news that’s more left than right in its partisanship, but being more conscious of frames has made me aware that I may just be confirming my biases rather than really seeking to know what’s happening in the world. The challenge now is how do I get to know what I don’t know? How do I actively go beyond my comfort zone knowing I will be uncomfortable? Natalie: I feel as though even an awareness of the concept of framing is important: understanding that what we read is filtered or contextualized helps us become more critical consumers of information. And, as Anushka mentioned, it can also provide an important exercise in perspective-taking. 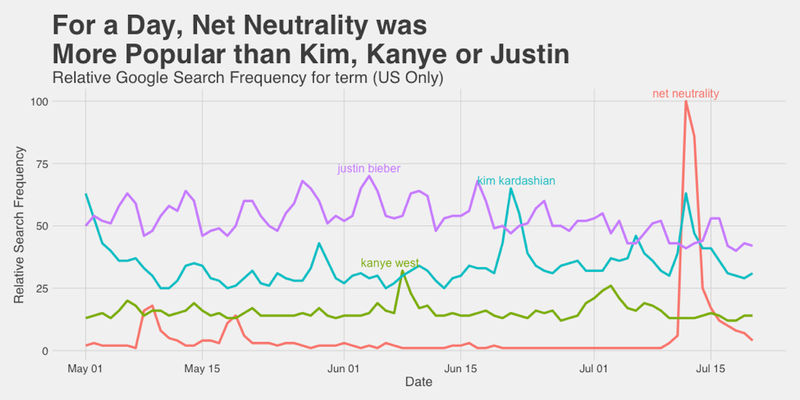 Media attention is an important aspect of framing: “For at least a couple of days, ‘net neutrality’ was a more popular search term than Kanye West’, ‘Kim Kardashian’, and even ‘Justin Bieber’ – from Net Neutrality, Kanye, and Hot Dogs on Media Cloud blog. Are there things you think that average news readers and writers could be doing when it comes to frames? Anushka: I think as news readers we need to start approaching content with the same tolerance we advocate approaching people with. We may not like hearing what someone on the other side of the spectrum is saying, but it’s still important to hear it because we probably have something to learn from it. This doesn’t mean we have to agree with it. Practically, it’s hard to read content very far left or very far right from where we stand, but if you’re a New York Times reader in the United States maybe read more of the Wall Street Journal or watch Chris Wallace’s Fox News Sunday show and vice versa. Beyond partisanship, when reading about issues try and interact more with the content by asking questions such as: Who is affected by this issue? How might they feel about this frame? Does this frame focus on a legal, political, economic, or social angle and what would the others look like? For example, media narratives about sexual assault are dominated by a law and order frame but fail to consider the social and psychological effects on women. 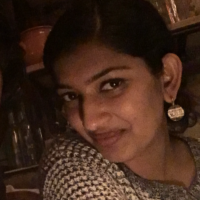 Anushka: I'm a Research Specialist on the Media Cloud project at the MIT Media Lab. Natalie: I'm a self-proclaimed global health nerd, perpetual optimist, and storyteller-in-training. Much of my current learning and doing happens through my role as a Research Fellow at the Berkman Klein Center and Research Affiliate with the MIT Media Lab’s Media Cloud project. Anushka: I spend about 2/3rd of my time in Cambridge, MA and the other 1/3rd in Mumbai which is where I grew up and which I still think of as home! I speak English, Hindi (India’s national language), Marathi (the language of the state in which Mumbai is located), Gujarati (my native language), and French! Natalie: I’m a citizen of Panagea! I'm Canadian based in Toronto, Canada right now, but I'm also Swedish. I’m lucky to have been surrounded by a diverse array of languages at home – English, Hebrew, Hungarian, French, Polish and Cantonese. I'm working on improving in those – including English :).